Mort Künstler Hand Signed and Numbered Masterpiece Collection Canvas Giclee:"Hero of Little Round Top"
Edition Size: Artist Signed and Numbered with COA to 50 Masterpiece Editions with 15 AP's.. Image Dimensions: 26" x 40"
About the Art: It was a desperate moment. The troops of the 20th Maine had been ordered to defend the left flank of the Federal line at Gettysburg "at all costs." Led by Colonel Joshua L. Chamberlain, a 35 year-old college professor and Christian theologian, the men from Maine had successfully repulsed repeated attacks by courageous Confederates from Alabama. Finally, exhausted and low on ammunition the valiant soldiers from Maine appeared near the breaking point. As the determined Southerners renewed the attack on Little Round Top with another assault against the Federal left flank. Chamberlain knew what was at stake. If his troops could not hold the line and the flank was turned, the Federal army might be destroyed, the battle lost - and the war with it. Facing what appeared to be impending destruction, Chamberlain did the unexpected: he ordered a bayonet charge. 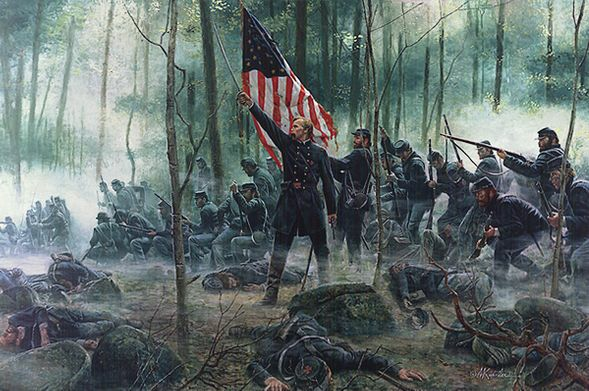 The battle-weary men in blue obediently fixed bayonets, charged down the hill Into the face of the enemy - and shattered the final Confederate assault. The day was won. Chamberlain would rise to brigadier general, survive four battle wounds, officially receive the surrender of Lee's army at Appomattox and enjoy postwar prominence as governor of Maine. Yet despite his many achievements he would always be remembered for his leadership in those desperate moments at Little Round Top on the second day at Gettysburg. Like his Confederate counterpart, General Robert E. Lee, Chamberlain would be revered for his wartime character. How did he and his troops do it? He would be asked that question repeatedly for the rest of his life. His reply: "In the privations and sufferings endured... in battle, some of the highest qualities of manhood are called forth - courage, self-command, and sacrifice of self for the sake of something held higher...." To generations of Americans - Southerners as well as Northerners - Joshua Chamberlain would hold an enduring position as the Hero of Little Round Top. In 1991, I was commissioned by the Turner organization to do artwork for the companion book to the motion picture, Gettysburg. The book, Gettysburg: The Paintings of Mort Kunstler proved to be a popular accompaniment to the motion picture and has sold more than 160,000 copies. I did a series of paintings of Joshua Chamberlain for the book including a study that later became the popular print, Chamberlain's Charge. Since then. I have been asked repeatedly when I would do another Chamberlain, This new work, Hero of Little Round Top, finally enables me to meet those requests. I realized that the moment before Chamberlain's famous charge was as dramatic as the charge itself. The scene I chose for this painting was the moment when Chamberlain ordered his troops to fix bayonets. That had to be one of the most dramatic moments in the entire Battle of Gettysburg. I also discovered a common misconception. It has been generally assumed that Chamberlain had no side arms on Little Round Top until he captured a Colt's revolver from a Confederate officer during the charge. It is also believed that Chamberlain had left his pistols in holsters on his saddle when the horse was taken to the rear. However, there is no known evidence to support this assumption, according to Curator Hawes and Dr. Thomas Desjardin, author of the book Stand Firm Ye Boys From Maine. The Maine Military Historical Society has in its collection a Chamberlain pistol. It is a Moore's Patent Firearms Co. S.A. Belt Revolver with a six inch barrel, patented in 1860 and commonly worn in a belt holster. The weapon's back strap is engraved "J.L.C." This revolver and the captured Colt are the only two pistols known to have been associated with Chamberlain. Both are described as "well tested in the Civil War" and "quite used to their business." Chamberlain's saddle, which is in the collection of the Pejepscot Historical Society, does not have holsters so it is unlikely that he left his revolver with his saddle. Mr. Hawes says, "…given the order to hold that ground at all hazards' (an ominous command suggesting a close fight) it would be hard to imagine Chamberlain leaving any of his weapons behind." My sincere appreciation for research assistance goes to Douglas Hawes and Dr. Thomas Desjardin. I'm also grateful to chief historian Kathy Harrison and historian John Heiser of the Gettysburg National Military Park, to Dennis Thoet of the Maine State Museum and to Amy Polin of the Pejepscot Historical Society in Brunswick. I am especially grateful to the legion of Civil War buffs and historical art enthusiasts who have urged me for so long to do another Chamberlain painting. Thank you! He was truly, The Hero of Little Round Top.